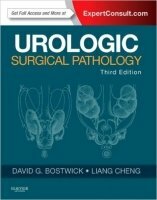 Nacházíte se: Booktook.cz → Odborná literatura → Cizojazyčné → Patologie → Urologic Surgical Pathology: Expert Consult - Online and Print, 3rd Ed. Urologic Surgical Pathology: Expert Consult - Online and Print, 3rd Ed. With sweeping revisions throughout, the new edition of Urologic Surgical Pathology equips you to accurately diagnose specimens of the entire urinary tract and male reproductive system plus the adrenal glands. Comprehensive in scope, this title begins with a look at normal anatomy and histology for each organ system...followed by discussions of the pathology of congenital anomalies, inflammations, non-neoplastic diseases and neoplasia. Practical guidance in daily urological pathology sign-out and the latest recommended diagnostic approaches - with an emphasis on clinicopathologic and radiographic-pathologic correlations - makes this a true diagnostic decision-making medical reference. A consistent format enables you to locate critical information quickly, and more than 1600 high-quality illustrations - most in full color - make diagnosis even easier. "A great update of a well know textbook. Uropathology colleagues find it useful".